Did you know that community pharmacies provide the most easily accessible influenza vaccine administration available in BC? With close to 4000 Pharmacists certified to provide drug administration in BC and approximately 95% of community pharmacies in BC currently operating with at least one Certified Drug Administration pharmacist on site, pharmacies are one of the most convenient and accessible ways for the public to protect itself from the annual flu virus. 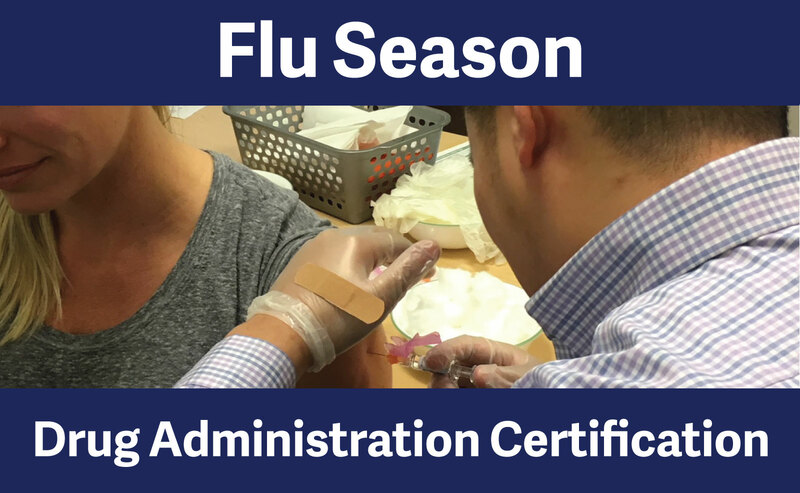 In order to administer immunizations, registrants must have the proper certification. As flu season is approaching, the College would like to remind registrants about a few things related to their Drug Administration Certification. You must have a valid (current) Drug Administration Certification before immunizing any patient. To confirm whether you have a valid Drug Administration Certification, go to the registrant (pharmacist) directory on the College’s website, found at “Find a Pharmacy or Registrant” link on the top of the website (or click here for a complete list of registrants). Note the status under the column “Authorized for Drug Administration”. Pharmacy managers should also confirm their pharmacist staff’s Drug Administration Certification status on a regular basis using the same directory. You must have a valid (current) certification in first aid AND Cardiopulmonary Resuscitation (CPR). Registrants must have valid and current certifications in both first and CPR in order to obtain, and maintain, their Drug Administration Certification. If either your first aid or CPR certification expires, your Drug Administration Certification will become invalid. It is important for registrants to check the expiry dates of their first aid and CPR certifications regularly, and to ensure that they renew these certifications before they expire. Pharmacy managers should record and monitor the expiry dates of each immunizing pharmacists’ first aid and CPR certification. You must have provided immunization (by injection/intranasal route), or completed an approved drug administration training course in the preceding three years in order to maintain your Drug Administration Certification. If you are approaching 3 years since you last provided an immunization or completed an approved drug administration training course, you must re-complete a Board-approved drug administration training course or provide another immunization (by injection/intranasal route) to maintain your Drug Administration Certification. Understand and be familiar with the standards, limits and conditions associated with your Drug Administration Certification for drug administration by injection and intranasal route. They can be found in the HPA Bylaw Schedule F Part 4 – Certified Practice – Drug Administration By Injection And Intranasal Route Standards, Limits And Conditions. HPA Bylaw Schedule F Part 4 – Certified Practice – Drug Administration By Injection And Intranasal Route Standards, Limits And Conditions.